In my last blog I outlined Crossrail SSW, a plan that gains 50% extra train paths on the SWML (South West Main Line) into London Waterloo, fully separating the long-distance, outer suburban and inner suburban services. This blog extends that proposal, making use of the extra capacity to enhance services in the Mole Valley. The Mole Valley towns of Leatherhead and Dorking do not get an especially good train service. The fastest train from Dorking takes 50 minutes, with neither the route to Waterloo nor the route to Victoria being especially fast. This proposal allows for a faster service, with other knock-on benefits. The proposal involves constructing a new railway line across open countryside from north of Leatherhead to south of Claygate. The route crosses the M25, A243 and A3, as well as the Prince's Coverts forest. The length of the link is 5.5km. At first glance, the link can seem like a strange choice. The shortest "missing link" in the area is Leatherhead to Chessington South, a link which was planned to be constructed in the past. However, the Chessington link would not have the same benefits as this proposal. The key point to note from the Crossrail SSW proposal is that the inner suburban service pattern is fully accounted for with Epsom, Chessington, Hampton Court and Kingston (the SWML slow lines). The long-distance service pattern is also fully accounted for (in the new express tunnel from Esher). However, there is still available tph capacity on the outer suburban pair of tracks (the SWML fast lines from Surbiton to Waterloo) as services to Woking and Claygate would not fill the available paths. Given the available spare paths, clearly the purpose of this proposal is to use some of them, say 4tph (trains per hour) to enhance the Dorking service. But this is only possible if the Dorking trains can reach the fast lines of the SWML before Surbiton. If the link were to go via Chessington, then the additional services would hit Raynes Park on the SWML slow lines, which would defeat the objective of enhancing the Dorking service (and detract from Crossrail 2 generally). By linking Leatherhead to Claygate, the fast Dorking services are able to join the SWML fast lines, exactly as the Guildford via Claygate services would. In total, the route from Leatherhead to Waterloo is about 1.5km longer via Claygate than via Epsom. But the faster line and fewer station stops would more than compensate. The expected service pattern would be 2tph Dorking, Leatherhead, Surbiton, Wimbledon, Clapham Junction, Waterloo. A journey time of 40 minutes from Dorking should be easily achievable, with 35 minutes being a better target. In cost terms, building in open countryside should be relatively cheap, however there are crossings of major roads to manage. An initial estimate of £250m seems appropriate (based on the Hitchin flyover at £50m). Improving the lives of the residents of Dorking and Leatherhead is not, in and of itself, going to be sufficient to justify the link. There are two other factors that should be considered. 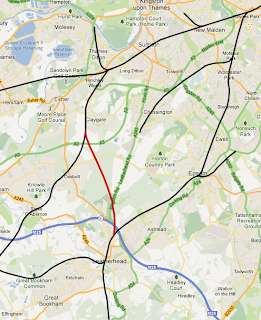 Firstly, the link provides much better access from mid-Surrey to the county town of Kingston (accessed via Surbiton). Providing the local links from Surbiton to Kingston town centre are top notch, this could encourage a reduction in the traffic making that journey, especially to shop. Secondly, and more significantly, the new link can be used to change services from Horsham. The route from Horsham to London (Victoria) via Dorking was the traditional route for services from the Arun valley line (Billingshurst, Arundel, Bognor Regis, Chichester). Over time however, the route became less well used by fast services, with a desire to boost services to Gatwick airport and East Croydon. Unfortunately, over time, the route via East Croydon has become very full, to the extent that major work will be needed to avoid or enhance East Croydon. Such a project would undoubtably be multi-billion pound. The great thing is that this proposal can step in to be a cheap approach to delay the need for that work. With the Mole Valley link open, this proposal intends for fast services from Horsham and the Arun Valley to run via Dorking and Surbiton to Waterloo instead of via Gatwick and East Croydon. This would be at least 2tph, and probably 4tph, of additional running between Horsham and Dorking. Horsham would still have services to Gatwick and East Croydon, but they would be slower ones via Redhill (probably Thameslink). There would probably be no direct service from the Arun Valley to Gatwick, at least in the peak. While Horsham has a long standing link to London Victoria, Waterloo is similarly located for Whitehall jobs and the West End, and cross platform interchange for Victoria at Wimbledon in Crossrail SSW provides for the rest. With this plan, it is intended that there would be no direct fast services from Horsham to Victoria. The key to this move is that it frees up at least 2tph through East Croydon. Those two paths would be enough to reduce the pressures on the need for a multi-billion pound rebuild there. As such, the £250m of the Mole Valley Link is a real bargain, even allowing another few million to improve the Horsham to Dorking route's line speeds. The Mole Valley Link is a 5.5km new railway line from north of Leatherhead to south of Claygate. It allows the Dorking services to join the SWML fast lines at Surbiton, avoiding the slow lines at Raynes Park. By enhancing journey times to Dorking it allows the fast services from the Arun Valley and Horsham to run via Dorking and Surbiton into Waterloo, instead of Victoria. Benefits are threefold - enhancing journey times to Dorking and Leatherhead (a 10 to 15 minutes saving), better links for mid-Surrey to Kingston, and reducing pressure on East Croydon through the re-routing of the Horsham services. If you have any views on the Mole Valley Link then why not leave a comment! This adjunct to your Crossrail SSW idea all seems so brilliantly sensible, logical and economically viable. Which unfortunately is absolutely no guarantee that it will ever be considered, never mind delivered by the powers that be. Your ideas should really be publicised amonsgt the MP's / Local Authorites / Press / Blogs in the SW trains / Southern area. Do you have any plans / realistic opportunities to do this? A very slight criticism is that I do think you might be overstating the Kingston linkage benefits. The links from Surbiton to Kingston will never be the required "top notch" without a dedicated busway or tram, both of which TfL has refused to support over the last decade, despite Kingston Council's backing. I've been busy with other projects in the past few years, but that is changing. Hopefully I can find some suitable contacts to talk to. The Kingston link is always a problem, and you are right that it needs to be high quality (taking over the Hampton Court branch and linking via Surbiton to Kingston with a DLR or tram type solution would be very effective). We can say that increasing links to Surbiton would make the Kingston connection more viable. I've just had a belated thought - is the Mole Valley link dependent on the extra capacity that Crossrail SSW would bring? Would enhanced links to Dorking / Leatherhead via Surbiton still be possible if a. the Hampton Court branch converted to a a higher frequency tram and b. the new junction was built as you describe?